Book a uniquely tailored private Thai Bodywork or Yoga session with Moira in her Dixon home studio. Specials available above and to the right. A typical session involves gentle stretching, palm, thumb, foot and forearm pressure along energy lines, rhythmic rocking, joint compression, decompression, and more. All stretching and pressure is done within the comfortable tolerance of the client, and the work is performed on a futon on the floor. Wear loose comfortable clothing, as you will remain fully dressed for this full-body treatment. Email askayogi@gmail.com or call 847-975-9642 to book your personalized session. Yoga- Active classes for all levels(must possess a basic level of fitness). Classes begin with meditation and will explore the full range of Yoga poses. Restorative Yoga- Soothe yourself with Restorative Yoga. Practice positions that deeply stretch the body and Yogic breathing exercises that calm the nervous system. The emphasis is on relaxation and flexibility in these prop intensive Iyengar based classes. Benefits range from stress relief to improvements in spinal alignment and mobility, sleep and respiration. All-Levels, including people with spinal issues, illness or other injuries welcome . 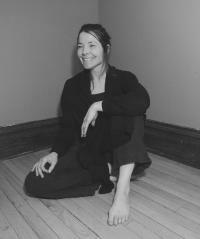 Moira OKeefe has taught Yoga classes and workshops since the early 90s. In addition to her initial Yoga certification from an ashram Moira is one of just a handful in Illinois certified in Yoga for Scoliosis under Elise Browning Miller and is a member of the B.K.S.Iyengar Yoga National Association of the USA. Moira's experience and continual training over the years with many of the top Yoga instructors in the field allow her the versatility to teach the full range of Yoga students. Her yoga teaching style has an element of challenge while maintaining a hypnotic feel. In addition to offering her students precise and personalized Yoga instruction with therapeutic benefits, Moira is a Thai Bodywork and Reiki practitioner. Whether its in a Yoga class or workshop(see events); or while receiving a Thai Bodywork or Reiki session, it is Moira's intention to bring her students and clients to as pain free and fluid a place as possible. By improving the flow of energy through the channels of energy and safely and gradually working through blockages in body and in mind, a state of grace is achieved. "He/She who does not venture does not cross the Sea"
"I’m always a little concerned when workshops take me out of my comfort zone, but Moira's workshop made me feel at ease; especially with the meditation at the beginning. Moira goes at a pace that allows you to adjust to the pose and offers plenty of suggestions for tweaking. Practicing with Moira is about as good as it gets." Interested in learning Reiki? I need just a minimum of 3 to schedule a training.